C++ How to Program presents leading-edge computing technologies in a friendly manner appropriate for introductory college course sequences, based on the curriculum recommendations of two key professional organizations–the ACM and the IEEE. The best-selling C++ How to Program is accessible to readers with little or no programming experience, yet comprehensive enough for the professional programmer. The Deitels’ signature live-code approach presents the concepts in the context of full working programs followed by sample executions. The early objects approach gets readers thinking about objects immediately–allowing them to more thoroughly master the concepts. Emphasis is placed on achieving program clarity and building well-engineered software. Interesting, entertaining, and challenging exercises encourage students to make a difference and use computers and the Internet to work on problems. To keep readers up-to-date with leading-edge computing technologies, the Tenth Edition conforms to the C++11 standard and the new C++14 standard. This title is also available with MyLab ™ Programming—an online learning system designed to engage students and improve results. 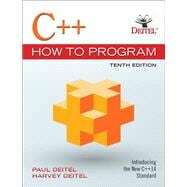 MyLab Programming consists of a set of programming exercises correlated to the programming concepts in this book. Through hundreds of practice problems, the system automatically detects errors in the logic and syntax of their code submissions and offers targeted hints that enable students to figure out what went wrong–and why. MyLab Programming improves the programming competence of beginning students who often struggle with the basic concepts and paradigms of popular high-level programming languages. For instructors, a comprehensive gradebook tracks correct and incorrect answers and stores the code inputted by students for review. Note: You are purchasing a standalone product; MyLab Programming does not come packaged with this content. Students, if interested in purchasing this title with MyLab Programming, ask your instructor for the correct package ISBN and Course ID. Instructors, contact your Pearson representative for more information. Paul Deitel, CEO and Chief Technical Officer of Deitel & Associates, Inc., has over 30 years of experience in computing. He is a graduate of MIT, where he studied Information Technology. He holds the Java Certified Programmer and Java Certified Developer designations and is an Oracle Java Champion. Paul was also named as a Microsoft® Most Valuable Professional (MVP) for C# in 2012—2014. Through Deitel & Associates, Inc., he has delivered hundreds of programming courses worldwide to clients, including Cisco, IBM, Siemens, Sun Microsystems, Dell, Fidelity, NASA at the Kennedy Space Center, the National Severe Storm Laboratory, White Sands Missile Range, Rogue Wave Software, Boeing, SunGard, Nortel Networks, Puma, iRobot, Invensys and many more. He and his co-author, Dr. Harvey Deitel, are the world’s best-selling programming-language textbook/ professional book/video authors. Dr. Harvey Deitel, Chairman and Chief Strategy Officer of Deitel & Associates, Inc., has over 50 years of experience in the computer field. Dr. Deitel earned B.S. and M.S. degrees in Electrical Engineering from MIT and a Ph.D. in Mathematics from Boston University–he studied computing in each of these programs before they spun off Computer Science programs. He has extensive college teaching experience, including earning tenure and serving as the Chairman of the Computer Science Department at Boston College before founding Deitel & Associates, Inc., in 1991 with his son, Paul. The Deitels’ publications have earned international recognition, with translations published in Japanese, German, Russian, Spanish, French, Polish, Italian, Simplified Chinese, Traditional Chinese, Korean, Portuguese, Greek, Urdu and Turkish. Dr. Deitel has delivered hundreds of programming courses to academic, corporate, government and military clients. Chapters 23—26 and Appendices F—J are PDF documents posted online at the book’s password-protected Companion Website, which is accessible from http://www.pearsonhighered.com/deitel.